Multiple sizes. Many of us have weight fluctuations and feel the need to keep clothing in a variety of sizes to accommodate the yo-yo. Complacency. i.e. not doing a real purge for more than a decade. These three factors worked together for this massively over-stuffed walk-in closet. We began by removing clothing. 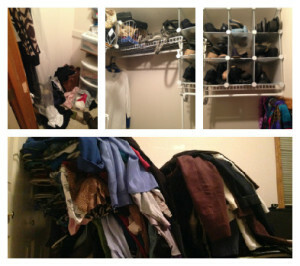 This closet was so full that I couldn’t even get walk in the walk-in closet for any BEFORE photos. Seriously, I tried and I fell over a pile of shoes and hangers. I did manage to snap a photo of one of the pile of “good bye” clothes. This project started by giving each item an honest, yes or no. I asked my client to take into account when she last wore the item, how it made her feel, how likely she was to wear it in the next three months, etc. It can be time-consuming but I didn’t allow us to spend more than 15 second per item. To combat the weight fluctuation, we decided to keep items which currently fit and a few basic items in one size larger. Stay with me now: purge all out-dated smaller sizes. This way, you can reward weight loss with new clothing. After we whittled the closet contents down, we then focused on separating wardrobe into purpose categories (such as “work” and “weekend”) and then by seasons. 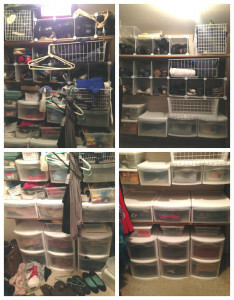 Finally, all items not necessary in daily wardrobing were removed from the closet to find a more appropriate home. This included things like mittens and winter scarves, headphones and pedometers, and umbrellas. 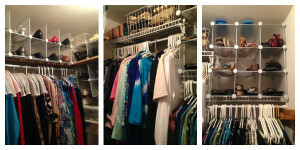 Can you walk into your walk-in closet?